I can’t count anymore how many copies of different magazines in different types of papers I have collected from the moment I started how to read and started how to appreciate written words especially that they’re printed with a targeted audience in mind. I felt that magazines are literary treasures, giving you a small window to someone else’s life, be inspired by them or like a go-to spread whenever you want to have something done for your DIY project. And I have to say, it’s just so rationally if not emotionally fulfilling to go through them over and over again. 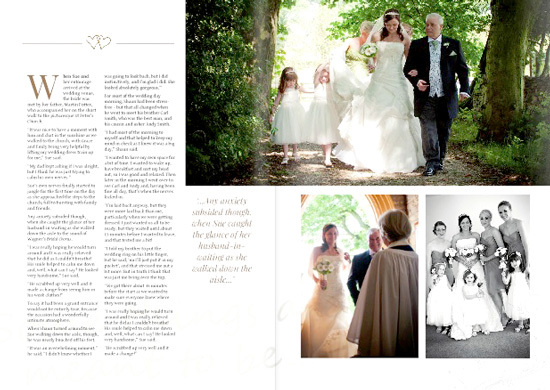 And this is how your wedding would like like in your personalised magazine, just lovely! Well, the digital age has given us again another awesome reason to love magazines even more. Did you know that we can now create our own personalised magazines online? Well, gone are the days wishing one day you’ll appear on the glossy cover. Now “There's a LifetimesMAG for every special occasion”. With this set-up you don’t need to be The Dutchess of Whatever to get your prince and princess published on a mag. You can create your own featuring your little ones milestones on a glossy with their sweet smiles on the cover. Not just for your children’s milestones but yours as an adult as well. We love magazines with splendid layouts, well then, you too can choose as to whatever style you want your magazines designed into, your choice. Wow! This sounds really like a remarkable project worth venturing into. I can’t wait to have mine on the roll. I’m into flower photography, the idea of collating all of my works and putting it into a personalised magazine of my own, wow that would be amazing.